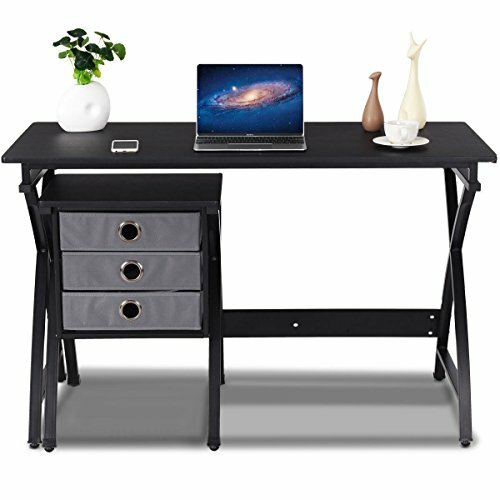 This contemporary style computer desk is a perfect furniture to fit your home or office. With its large full-size workstation, this desk provides you a unmatched convenience for your work. Create a stylish working station, storage unit in one with this unique desk. It is enough to meet your daily needs. Made of high-quality MDF and steel, this computer desk is sturdy and durable. three sliding-out drawer offers more storage space for your daily supplies. Don't hesitate to add it to your cart! 【Beautiful Design & Simple Style】The design of the computer desk is beautiful and elegant. The classic X-shaped legs and the overall black design highlights the simple modern style. It is ideal for decorating a bedroom, living room, study or office. This is your ideal choice! 【Free Combination Collocation】This computer desk is unique in design and has a free-standing drawer. Not only to provide you a lot of storage space, but also allows you to play creative, mix and match at random. You can put many things in the 3 drawers. 【Multi-function Use】The computer desk has a variety of ways to use it. This multi-functional table can be used as a computer desk, desk, side table ,etc. You can put it in your bedroom, living room, study, office and other places. Create a stylish working station, storage unit in one with this unique desk. It is enough to meet your daily needs. 【Adjustable Foot Pad】The rotating mat of the computer desk legs are also a unique design, when the environment is uneven ground, do not be afraid of table instability, you can rotate the bottom of the mat to adapt to uneven ground. Keep your computer desk steady and provide you with a comfortable working environment. 【Installation & Easy to Clean】The computer desk is need to be assembled by yourself. You can quickly assemble the item and use it in a clear and easy-to-understand manual. In addition, You can use wet cloth to wipe dirty stain easily from the surface.